David Attenborough has been widely lauded in headlines worldwide for his dramatic claim that is"civilisation" is to be saved then "we" have just thirty years in which to "take action" -- that action being in the main, as per his speech, government action to ban private actions. “The world’s people have spoken," claimed Attenborough. "Time is running out. They want you, the decision-makers, to act now." A strange claim indeed to make in a week in which many of France's people set fire to Paris to protest the decision-makers' new French carbon tax. 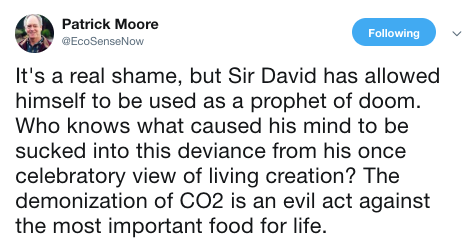 It's a real shame, but Sir David has allowed himself to be used as a prophet of doom. Who knows what caused his mind to be sucked into this deviance from his once celebratory view of living creation? The demonisation of CO2 is an evil act against the most important food for life. Even if the doom-mongers were correct about the science, of course, that would say nothing at all about the action to be taken. 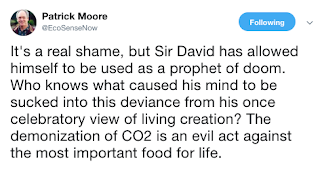 Bjorn Lomborg for example warns that "strong global climate action would cause far more hunger and food insecurity than climate change itself.” And civilisation itself demands in any case that we take the doom-mongering cautiously. Before any implication for action can be present, additional information is required. One essential piece of information is the comparative valuation attached to retaining industrial civilisation versus avoiding global warming. If one values the benefits provided by industrial civilisation above the avoidance of the losses alleged to result from global warming, it follows that nothing should be done to stop global warming that destroys or undermines industrial civilisation. That is, it follows that global warming should simply be accepted as a byproduct of economic progress and that life should go on as normal in the face of it. Modern, industrial civilisation and its further development are values that we dare not sacrifice if we value our material well-being, our health, and our very lives. It is what has enabled billions more people to survive and to live longer and better. Here in the United States it has enabled the average person to live at a level far surpassing that of kings and emperors of a few generations ago. The foundation of this civilisation has been, and for the foreseeable future will continue to be, the use of fossil fuels. Nevertheless, there is a reason most people sleep far more easily than they should given all the doom-mongering going around -- and there is a very good reason for that: which is the many, many years of fatuous, fat-headed environmental predictions made by a litany of worry-worts and misanthropic headline-hunting doomsayers. Britain's industrial growth will come to a halt because its coal reserves are running out “… it is useless to think of substituting any other kind of fuel for coal... some day our coal seams [may] be found emptied to the bottom, and swept clean like a coal-cellar. Our fires and furnaces ... suddenly extinguished, and cold and darkness ... left to reign over a depopulated country." Demographers agree almost unanimously on the following grim timetable: by 1975 widespread famines will begin in India; these will spread by 1990 to include all of India, Pakistan, China and the Near East, Africa. By the year 2000, or conceivably sooner, South and Central America will exist under famine conditions....By the year 2000, thirty years from now, the entire world, with the exception of Western Europe, North America, and Australia, will be in famine. It is already too late to avoid mass starvation. …some scientists estimate that the world's known supplies of oil, tin, copper, and aluminium will be used up within your lifetime. The period of global food security is over. As the demand for food continues to press against supply, inevitably real food prices will rise. 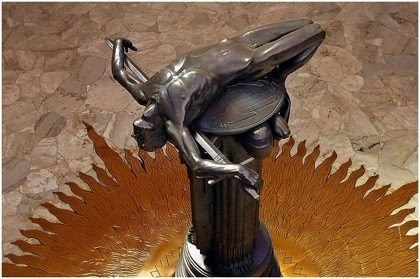 The question no longer seems to be whether they will rise, but how much. Before 1985, mankind will enter a genuine age of scarcity…in which the accessible supplies of many key minerals will be facing depletion. Dr. S. Dillon Ripley, secretary of the Smithsonian Institute, believes that in 25 years, somewhere between 75 and 80 percent of all the species of living animals will be extinct. There are ominous signs that the earth’s weather patterns have begun to change dramatically and that these changes may portend a drastic decline in food production—with serious political implications for just about every nation on earth. The drop in food production could begin quite soon… The evidence in support of these predictions has now begun to accumulate so massively that meteorologist are hard-pressed to keep up with it… This [cooling] trend will reduce agricultural productivity for the rest of the century. At the present rate of nitrogen buildup, it’s only a matter of time before light will be filtered out of the atmosphere and none of our land will be usable... If present trends continue, the world will be about four degrees colder for the global mean temperature in 1990, but eleven degrees colder by the year 2000. … This is about twice what it would take to put us in an ice age. Indeed, when we wake up 20 years from now and find that the Atlantic Ocean is just outside Washington, D.C., because the polar icecaps are melting, we may look back at this pivotal election. --New York Times foreign affairs columnist Thomas Friedman, writing in NY Times, Dec 8, 2000. Frostban -- a harmless bacteria genetically engineered to protect plants from freezing temperatures -- "could irreversibly affect worldwide climate and precipitation patterns over a long, long period of time. The economic impact of BIV (Bovine Immunodeficiency Virus) on the beef and dairy industries is likely to be devastating in the years to come. Biotech crops will "run amok"; they will create "super bugs"; they will lead to farmers using "greater quantities of herbicides." The next flu pandemic could kill as many as 150 million people. --Dr. David Nabarro. WHO spokesman Sept 2005. As many as 142 million people around the world could die if bird flu turns into a "worst case" influenza pandemic and global economic losses could run to $4.4 trillion - the equivalent of wiping out the entire Japanese economy for a year. --Report entitled Global Macroeconomic Consequences of Pandemic Influenza, from the Lowy Institute in Australia. Feb 2006. The seven atmospheric scientists predict a global warming of ''almost unprecedented magnitude'' in the next century. It might even be sufficient to melt and dislodge the ice cover of West Antarctica, they say, eventually leading to a worldwide rise of 15 to 20 feet in the sea level. We've got to ... try to ride the global warming issue. Even if the theory of global warming is wrong ... we will be doing the right thing anyway in terms of economic policy and environmental policy. We have to offer up scary scenarios, make simplified, dramatic statements, and make little mention of any doubts we might have. ... Each of us has to decide what the right balance is between being effective and being honest. [Within] as little as 10 years, the world will be faced with a choice: arable farming either continues to feed the world’s animals or it continues to feed the world’s people. It cannot do both. On June 23, 1988, NASA scientist James Hansen testified before the House of Representatives that there was a strong "cause and effect relationship" between observed temperatures and human emissions into the atmosphere. At that time, Hansen also produced a model of the future behaviour of the globe’s temperature, which he had turned into a video movie that was heavily shopped in Congress. That model predicted that global temperature between 1988 and 1997 would rise by 0.45°C. Ground-based temperatures from the IPCC show a rise of 0.11°C, or more than four times less than Hansen predicted. The forecast made in 1988 was an astounding failure, and IPCC’s 1990 statement about the realistic nature of these projections was simply wrong. In a 2007 case on auto emissions, [James Hansen] stated in his deposition that most of Greenland’s ice would soon melt, raising sea levels 23 feet over the course of 100 years. Subsequent research published in Nature magazine on the history of Greenland’s ice cap demonstrated this to be impossible. Much of Greenland’s surface melts every summer, meaning rapid melting might reasonably be expected to occur in a dramatically warming world. But not in the one we live in. The 'Nature' study found only modest ice loss after 6,000 years of much warmer temperatures than human activity could ever sustain. We have at most ten years—not ten years to decide upon action, but ten years to alter fundamentally the trajectory of global greenhouse emissions. According to Dr David Viner, a senior research scientist at the climatic research unit (CRU) of the University of East Anglia, within a few years winter snowfall will become "a very rare and exciting event” … “Children just aren’t going to know what snow is,” he said. The Scottish skiing industry has no more than 20 years left. Unless drastic measures to reduce greenhouse gases are taken within the next 10 years, the world will reach a point of no return, Gore said. He sees the situation as "a true planetary emergency." More efforts than ever before must be exerted to enable poor countries to prepare for impacts because it had been estimated that there would be between 50 million and 200 million environmental migrants by 2010. In 2020, the UN has projected that we will have 50 million environmental refugees. A team of international climate scientists and researchers at NASA claims the Arctic summer will be ice-free in 2013. “We’re toast if we don’t get on a very different path,” [said James] Hansen and his fellow scientists [who] saw a tipping point occurring right before their eyes and that the Arctic was melting exactly the way they said it would..
Hansen added that the Arctic would be ice-free in 5 to 10 years. Already last October I was predicting that the Arctic could be ice-free this summer” and “In August or September we will be seeing people cruising in sailboats up there. Sydney's dams could be dry in as little as two years because global warming was drying up the rains, leaving the city "facing extreme difficulties with water." Brisbane will never again have dam-filling rains, as global warming has caused "a 20 per cent decrease in rainfall in some areas" and made the soil too hot, "so even the rain that falls isn't actually going to fill our dams and river systems ... "
We only have four years to save the world. If “there’s no action before 2012, that’s too late... What we do in the next two to three years will determine our future. This is the defining moment,” he said. We have hours to act to avert a slow-motion tsunami that could destroy civilization as we know it.. Earth has a long time. Humanity does not. We need to act urgently. We no longer have decades; we have hours. We mark that in Earth Hour on Saturday. Capitalism and consumerism have brought the world to the brink of economic and environmental collapse, the Prince of Wales has warned in a grandstand speech which set out his concerns for the future of the planet. The heir to the throne told an audience of industrialists and environmentalists at St James's Palace last night that he had calculated that we have just 96 months left to save the world... Delivering the annual Richard Dimbleby lecture, Charles said that without "coherent financial incentives and disincentives" we have just 96 months to avert "irretrievable climate and ecosystem collapse, and all that goes with it." "Over the past 50 years, southern Australia has lost about 20 per cent of its rainfall, and one cause is almost certainly global warming ... In Adelaide, Sydney and Brisbane, water supplies are so low they need desalinated water urgently, possibly in as little as 18 months." never having to say you’re sorry.